The last weekÂ or so we have seen some cooler mornings which has almost felt a little like winter. I have no problem with winter and what it brings to the region as it means shorter days, log fires, better fishing and other activities such as rugby and hunting. I think it has beenÂ a long summer this year and we are ready for a good rain and wash out to freshen things up. I have fished the Hine and the Tongariro this week with varying success. Oh my god they all need a good wash out especially the Hine. The Hine has a few fresh fish moving in but they are spooky and hard to catch as the river is so low and clear especially on bright days. Early in the morning in the deeper pools are getting the best results fishing very light. 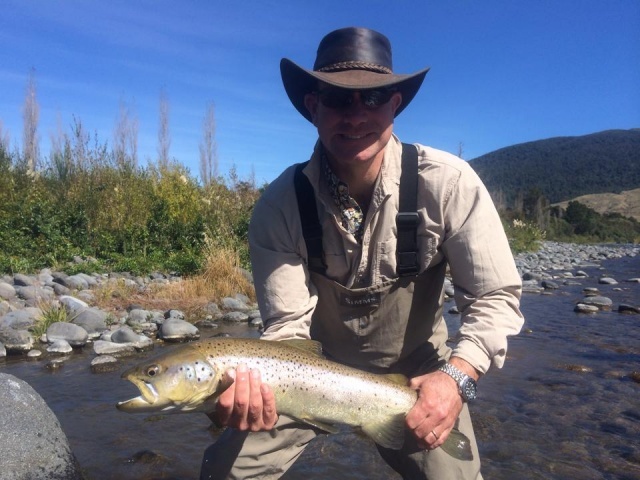 The Tongariro has been ok………there are fish spread through most of the river but again on bright days and clear conditions the going can be quite tough for some. Still we are seeing plenty of browns in the deeper pools and on the edge of likely looking current lines but even they are starting to look aÂ bit skinny from spawning. A few solid rainbows have been caught as they are entering in small spasmodic bursts but nothing to write home about. Juvenile fish are everywhere and anyone letting their nymphs swing will soon be picking up these feisty little guys which are better than nothing I suppose. A small amount of dry fly seems to be happening late in the afternoons but nothing which would make me take the nymphing rig of for. The swallows were having a great feed of something the other day but I couldn’t see anything on the water which the naked eye could pick up, Im sure the trout would find them though. Dark nights should again be upon us for a while and this will be good for the night fisherman both in the river and the river mouths. Some really well conditioned trout should be caught at the river mouths right now which will be indicative of what we can expect in the spawning runs this winter. We really need some rain and a week of average weather to flood rivers and kick start this for us, very early days at this stage though. I have the rest of the week on the river including a raft trip over the weekend which will be great and then my focus will be to hunting the deer as they have started their “ROAR” season now. This will most likely only last a few days in my area and then we will back into fly fishing and hopefully into some winter fish.